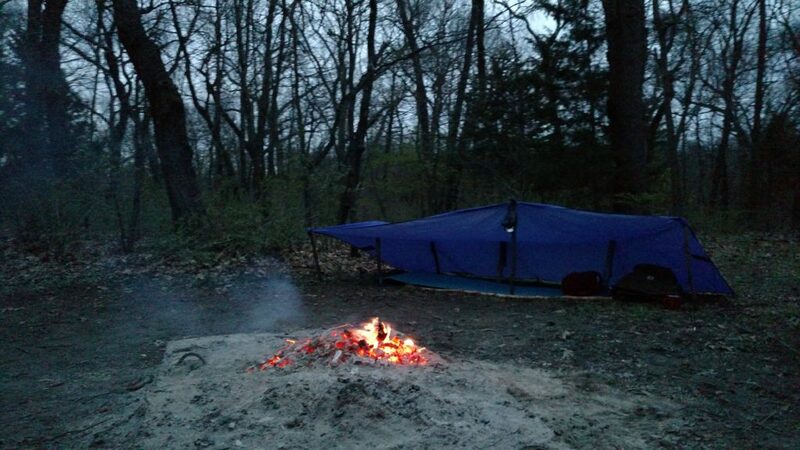 In early April I drove a couple hours south to Sand Ridge State Forest to spend a night alone in one of the back country camp sites. 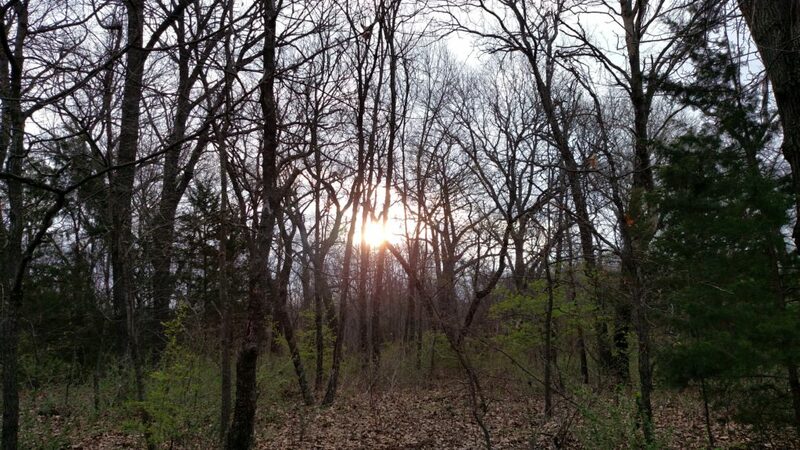 I got a little lost on the trails, dealt with some unusual weather, and had a wonderful time by myself in the woods. Read on for the full story. I looked at the map, looked at the trail to my left and my right, then back down at the map and compass. I wasn’t really lost, not exactly. I actually knew where I was; I was standing in front of Back Country Site number 10. The only problem was that I was supposed to be at Back Country Site number 11. Much like when I awoke to the absence of fire during my winter overnighter I felt panic’s first few tickles creeping up, but I caught them and pushed them away. Panic never helps, and I knew I didn’t need it anyway. I took off my pack and had a swig of water. I don’t know why I call myself kid in these situations. I was right on all counts, it was a gorgeous place, and a warm sunny day. I did know how to get back to my car without a problem. Worst case scenario, I could always bail. After a little water and a few minutes looking at the map, I knew it wouldn’t come to that. 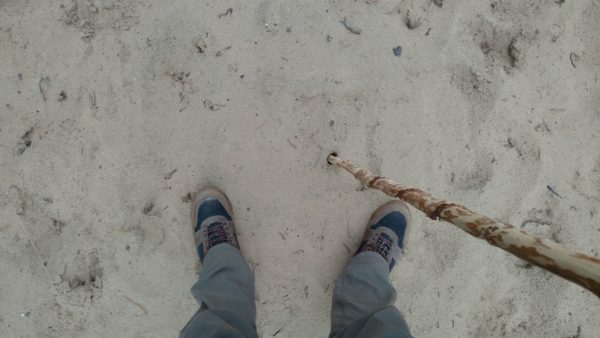 I slung my pack across my shoulders, shifted the weight to my hips, and started retracing my footsteps. Back to the trail head I go! Since December, I had been eager to take another camping trip, but my schedule hadn’t been very forgiving. Eventually, I decided that I just needed to do it, schedule be damned! So I sought out some additional sites where I could pack in, as opposed to car camping, eventually deciding upon Sand Ridge State Forest, near Forest City, IL. Sand Ridge is a bit of an oddity in Illinois. Surrounded by a sea of corn and soybean fields, Illinois’ largest state forest seems more Southwestern than Midwestern. The result of prehistoric desert-like conditions, you’ll find oak and hickory woodland, pine plantations, and sand prairies that exist nowhere else in the state. 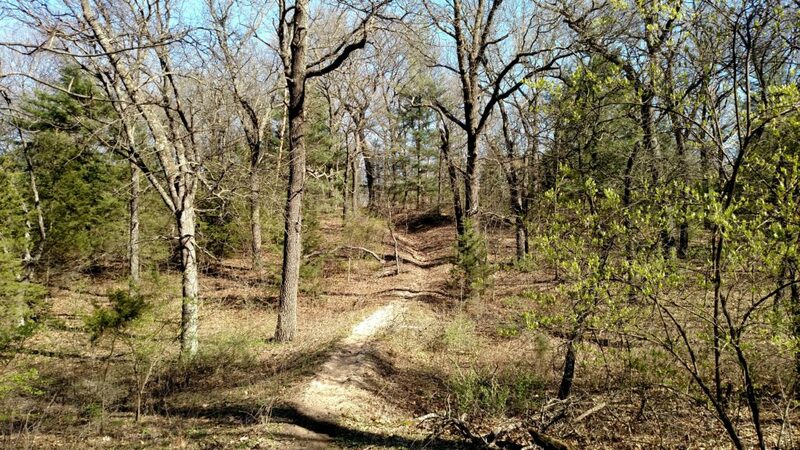 Rolling hills and sandy soil make for challenging hiking in some spots, but it’s a unique gem in the Midwest, and well worth checking out. Sandy trails are no joke! They can really wear you out. 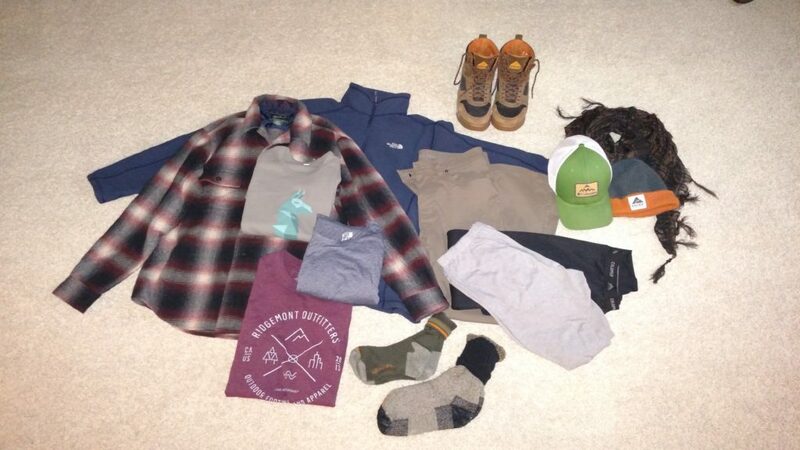 This may look like a lot of clothes (because it kind of IS a lot of clothes) but since I took a light sleeping bag, I was counting on layering to keep me warm. 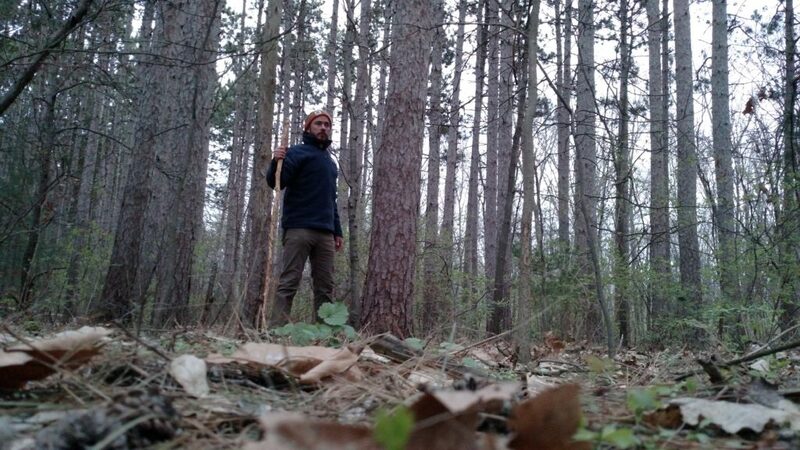 For bottoms, I had an inexpensive base layer made by 32 Degrees, a heavier mid layer by Cold Pruf (I didn’t put either of these layers on until later in the evening), and a pair of Prana Brion hiking pants. On top I had a 32 Degrees base layer, a Ridgemont Outfitters T-shirt, a Cotopaxi long sleeve, and my Woolrich Bering Wool shirt (one of the best purchases I’ve ever made). I also carried a North Face pullover to layer on top of everything, which I wouldn’t put on until later that night. I wore some cheap hiking socks with equally cheap liners under my Monty High boots from Ridgemont Outfitters, but I also took a pair of wool socks to sleep in, since I’m notoriously cold-footed. I wore a Columbia ball cap during the day, but a stocking cap (also from Ridgemont Outfitters) when it got cold, and a cheap keffiyeh, which really helps with drafts. Not pictured are my unders; a pair of Icebreaker boxer briefs. I also slept in a cheap pair of mittens. 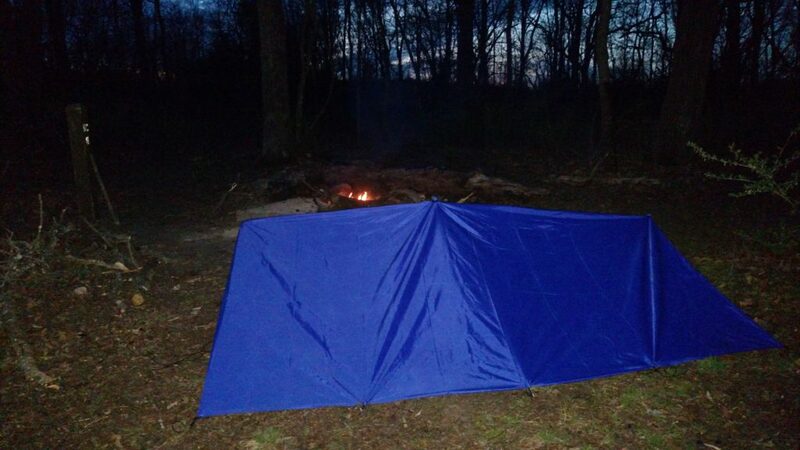 Since I packed everything into my Cotopaxi Volta, I didn’t carry a tent, and just used a tarp shelter. Instead of the big general purpose tarp I had used in December, I took an all-purpose waterproof shelter made by Hammock Bliss given to me by my friend Mike over at One Relentless Life. It packed down pretty small and light, and ended up making a pretty stellar shelter that survived some unusual weather (don’t worry, you’ll hear all about it momentarily). 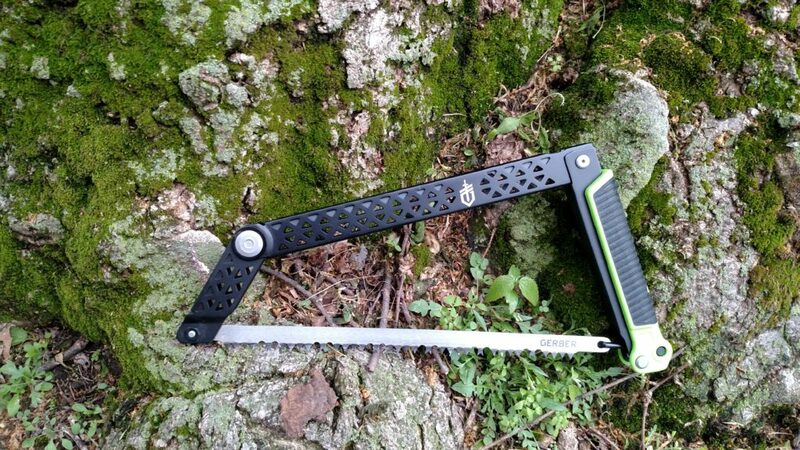 I also carried a Gerber Freescape Camp Saw. Clarissa and I received it as a gift, and I wanted to see how it performed. To cut down on weight, this was the only tool I carried with me, except for my Mora, which I take with me on every outing. After some packing, unpacking, reviewing, and repacking, everything fit nicely into my Volta Rolltop. The drive was a pleasant two hours from the Quad Cities, give or take. The sun was shining, a gentle breeze was blowing, and I was enjoying the journey. I pulled in, found headquarters, had a chat with the ranger, and I was ready to go. 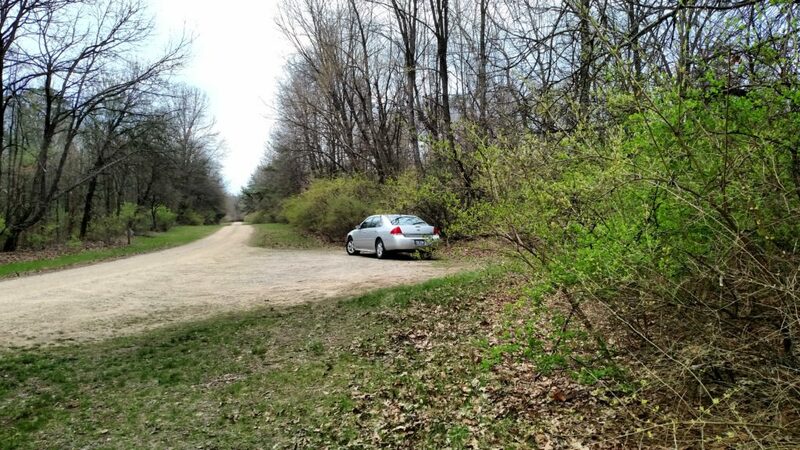 I drove to the trailhead, parked the car, and started walking. 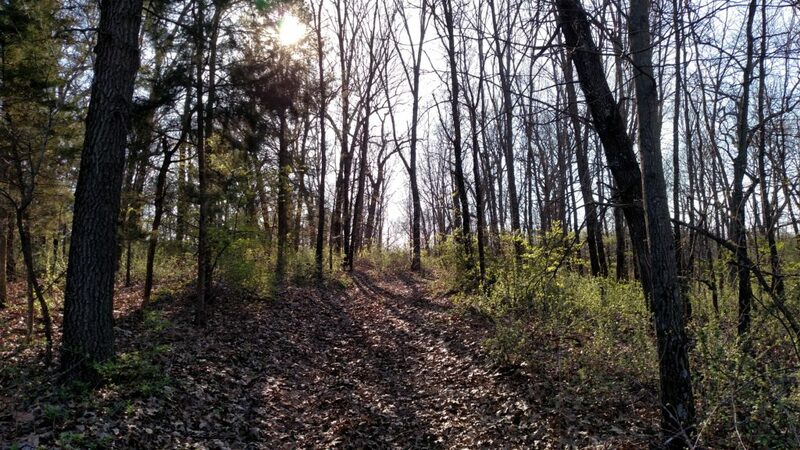 As I followed the trail I breathed deep, soaked in the sunlight, shed layers, and at one point I patiently waited for a skunk to make his way down the path. 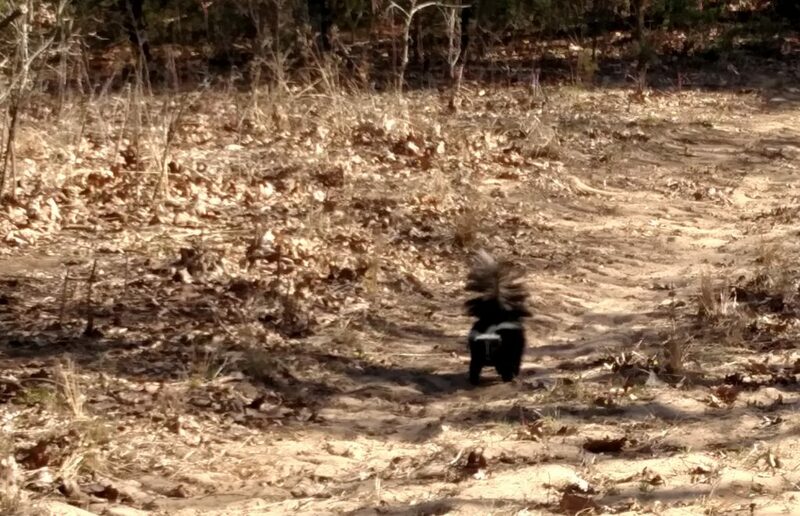 When it comes to skunks, they always have the right of way. Please, do take all the time you need, good sir. After he moved along, I did as well. I occasionally glanced at the map, and though it seemed a little off, I pressed on. Since you’ve read this far, you already know how that went. I got lost. It’s embarrassing to fess up to, but it’s the truth. So embarrassment aside, understand that anyone can end up lost; this isn’t the first time for me, and it won’t be the last. When it happens, DON’T PANIC! I know, easier said than done, but it’s the best bit of advice I can give you when it comes to getting lost (or for any situation really). In this instance, despite the initial gut check, I knew I’d be fine. I had filed a flight plan; people knew where I was supposed to be and when I was supposed to return. I’d stayed on the trails and had passed a couple of people along the way. I knew that if I just kept walking North I would eventually hit 2500 North County Road, and I had full signal on my phone. Put all of that together and getting lost just wasn’t a big deal. I knew exactly how to get back to the trail head, but even if I hadn’t I would have been fine. In other circumstances, getting lost can be deadly (which is the exact reason we have flight plans and bail out plans). Don’t think I’m making light of it, because that’s not my intention. What I’m saying is that everyone is going to get lost at some point, and it’s important to remain calm, to slow down and think, and to take stock of your resources. When it comes down to it, if you have a working cell phone and a good signal, then you’re really only lost until you place a call or pull up a map; in other words, you’re just lost by choice. Which is exactly what I was; I could have pulled up sat-nav on my phone or called for help, but I didn’t. Because in the future I’ll have adventures where I won’t be just a phone call away from aid. I intend to grow into larger challenges, so every step I take in self-reliance now will pay dividends in the future. In this instance, I knew the path I had taken to get where I was, so I retraced it. Within a half mile from the trailhead I located the turn I should have made, and corrected course. Less than an hour later, I walked into my site. Ah, finally walking into Camp Intrepid for the evening. I’ll be setting up right around the bend. What a relief! Once there, I dropped my Volta, sat down on the ground, drank more water, and looked at my watch. I still had two hours until sunset. Not as much time as I had wanted, but plenty of time to get everything situated. So I got to work, starting with gathering firewood. Previous occupants of the site had left me some good dry kindling in a pile. Excellent, one less thing I had to do. 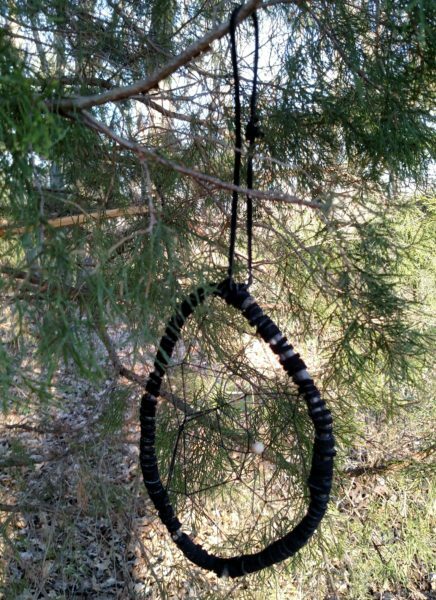 They also left this dreamcatcher in the tree by the site’s entryway. They must have wanted to ensure pleasant dreams at Back Country Site #11. I began piling up some larger dead fall for fuel. Luckily, plenty of bone dry wood littered the ground within easy carrying distance. I didn’t need a bonfire, just enough for a little warmth, some basic cooking, and a bit of light. I used the Gerber saw to process some limbs into more manageable sizes, and it performed pretty well. Admittedly, I took this picture by a tree at home, because I forgot to take picture of it while in the field. It’s not a perfect tool, but it got the job done and I’m glad I brought it along. The blade was sharp, flexible, and strong. Overall the construction proved rugged enough to take a little bit of a beating without a problem. It does have a little more weight than is ideal for packing in, but I’ve definitely used and carried worse. It’s a nice addition to our kit, but I think it will really shine when we’re car camping. I gathered more wood than I expected to use; remember, it always takes more than we think it will to keep a fire burning! I made sure to process everything that required the saw to cut down; I wasn’t particularly interested in using an unfamiliar tool after sundown, so I cut some thicker branches, then folded the saw back up, and stowed it in my bag. With a nice sized stack of firewood, I started in on my shelter. I laid out the hammock fly and decided to make a lean-to. I got an initial version up, but I noticed a lot of sagging. I took a break to eat a protein bar, chug some water, and light my small campfire as the sun started to sink lower in the sky. With a little food in my belly, and a little extra light from the campfire, I thought that perhaps my shelter would work better with a little bit of buttressing; yes, like a cathedral. Luckily, some of the firewood I had processed could be drafted into service as support structures, sparing them from their fiery fate. Not a bad setup at Camp Intrepid, although this particular photo was shot the following morning. Not perfect, but pretty solid. The supports remained standing only because of constant pressure from the fly, which might not have been ideal, but it worked. The wind had been pretty steady while I built the shelter, and I had purposefully laid it out so that the wind would go over the structure, not into it. It started to get pretty gusty after sunset, and my shelter stood up to it no problem. Here’s a view of the back. This worked out nicely, because the wind (and assorted other weather) blew right over the top, which also shielded my fire a bit! I had a fire with plenty of wood to last through the night. 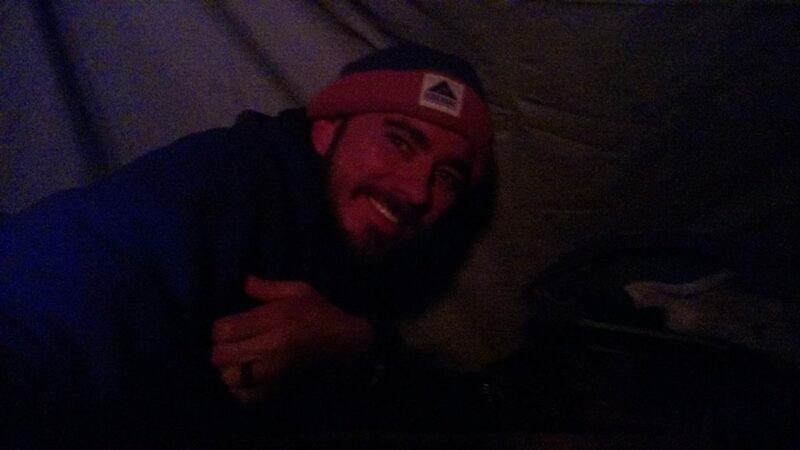 I had a shelter set up and my gear laid out inside. Time to relax; I put one of my layers back on, and sat down near the fire. I read a little out of an old favorite (Daniel Quinn’s Beyond Civilization), and enjoyed the sound of the wind, the birds, and the leaves. Some coyotes howled from the South. More echoed from the North. It sounds unnerving when you hear it, but I’ve never been bothered by them when camping. While the sounds of their howls and yowls made the hair on the back of my neck stand up, I didn’t worry. As coyotes are tricksters in mythology, so too are they in real life; just a few coyotes can yip, bark, and yowl in such a manner that it sounds like a huge pack. Or so I’ve read. I figured I might as well throw a little more wood on the fire anyway, just in case. It was a nice little campfire. After the sun fell beyond the horizon, the temperature started to drop. Time to put on those additional layers I had brought. I kept my fire fairly small because of the strong wind, so while it provided some heat, I relied on my layering to maximize warmth. Swaddled in all my clothing, I threw some dinner on the coals, had a bite to eat, and made a little hot chocolate. Sitting by the fire, sipping out of my granite-ware cup, I felt pretty cozy. I was warm, I smelled gloriously like wood smoke, and the wind was singing through the trees. It made me feel a bit like singing along, so I did. When you’re camping alone, no one can question your choice of Irish folk songs sung around your fire. I very much so felt right at home. I didn’t notice it at first, but then a few flakes somehow made their way down the back of my shirt (miraculous really, considering my many layers). The snowfall was steady, but not too heavy. I wasn’t concerned with it extinguishing my fire, but since I was wearing all my clothes, I decided it was best to get in my shelter; spending the night in wet clothing wouldn’t be very fun, so into the shelter I went! The shelter situation wasn’t too shabby. 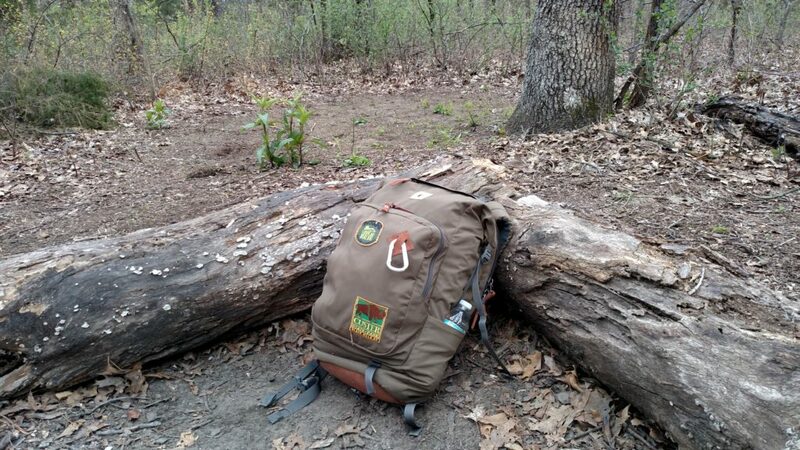 I could lay down and had plenty of room for my pack. Nothing was getting wet, and I could relax pretty easily. There wasn’t enough space to sit up, but I could lay on my stomach and hold my shoulders and torso up on my elbows to read. When my back got stiff, I could roll over and hike my knees up enough to place my book on them and keep reading by head lamp. Between my layers and a bit of reflective heat from the fire, I felt pretty comfortable. I couldn’t seem to get a break from the weather. The rain was coming down harder and faster than the snow had fallen. I grew concerned that it might extinguish my fire; while it wouldn’t have been the end of the world, I always find my fire very comforting, and I had hoped to keep a small one burning. So despite not wanting to get wet, I rolled out of the shelter and quickly set about rebuilding the fire. My initial fire lay had collapsed into a pretty chaotic pile, so I built a new tipi over the old one. A tipi fire lay works well in the rain, because it will shield some of the coals from the falling water, while also funneling air through the base and upward; similar to a chimney. That airflow will help the fire burn hot, keeping the fuel burning as it gets wet. Of course, if it rains hard and fast enough, the fire will go out. Luckily, the rain slacked off a bit, and though it got a bit damp and smoky, my fire kept burning. I still felt pretty good. I had faced getting lost, snowfall, and rain, and was no worse for wear. Then it started to hail. I laughed. I mean, hell, what is there to do at that point except laugh about it. It wasn’t any worse for my fire than the rain, it wasn’t heavy enough to damage my shelter. It was just, well, hilarious. So I laughed. I stayed toasty and warm in my shelter with all these layers on! There are things we can control, and things that we can’t. I could control my fire lay, my shelter, my clothing. I had brought rain gear and an emergency blanket in case I got drenched. For the most part, however, I cannot command the weather; as with most things we can’t control, it was best to go with the flow. Worst case scenario I could always throw on rain gear, pack up my stuff, hike back to the car, and migrate to a cheap motel. So I laughed. I read for about a half an hour until the hail let up. My shelter survived, my fire survived, and I survived. The unusual weather proved to be merely a mild inconvenience, albeit a funny one. I added some wood to the fire, and sat for awhile. 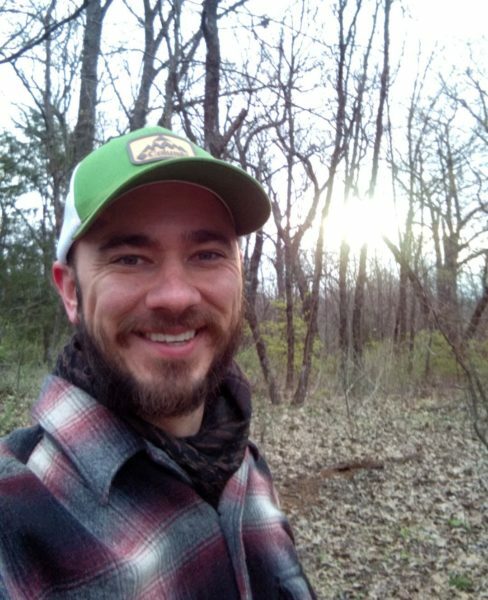 Despite getting lost and the meteorological phenomena, I was happy to be out in the woods alone. Like I said, we can’t control everything, and nothing ever goes exactly as planned, but that doesn’t mean that we can’t have fun when things go a little sideways. It is, after all, an adventure, and nothing rejuvenates me better than that. I let the fire burn down to coals, then stacked some hard wood tightly on them. Hopefully they’d burn slowly and I could still get a little reflective heat from the fire in my shelter. I had a similar plan on my December outing, and it hadn’t been very effective. I wanted to avoid a similar situation, but took comfort in knowing that if I had managed to rebuild the fire on that trip, I could do it on this one. With that, I pulled off my boots, put on my wool socks, climbed into my shelter, wormed into my fleece bag, and dozed off. A few hours later I woke up cold. Oh no, not this again! 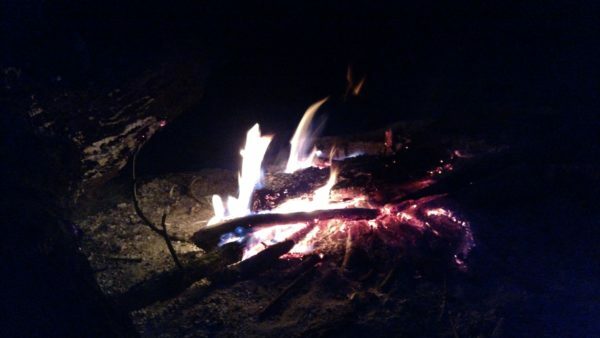 Actually, it turned out to be no big deal; I threw a few more branches on the fire, and with a little more reflective heat, I dozed back off again with no trouble. I awoke some hours later and found myself cold again. This time all my layers had worked their way up exposing my back. I move around a lot in my sleep, so that’s not a surprise. I checked my watch and it was 5:30 am. I knew the sun was going to rise roughly an hour later, so I decided to stay up and enjoy it. Of course, the thing about a sunrise in the middle of the woods on an overcast morning is that you don’t actually see the sun rising. But it’s still pretty beautiful. I munched on some chocolate covered espresso beans, grabbed my stave, and started down the trail for a little early morning walk. 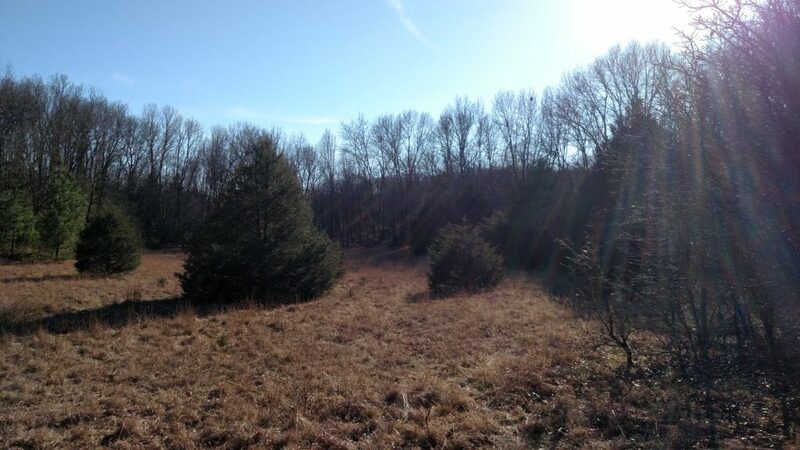 Less than a mile away the trail curved into a stand of pine trees swaying in the increasingly stronger winds. On my approach I scared a turkey out of it’s roost high in one of the trees; of course, I was too slow to get my phone and snap a photo before he got away. To be fair, his sudden movement almost gave me a heart attack, so my first thought wasn’t to get a picture. 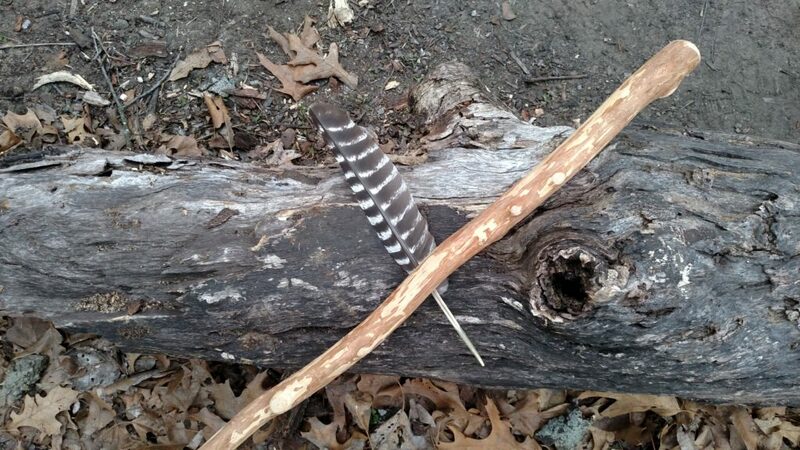 I did find this feather he left behind. The sound of the pines swaying in the wind made me want to stay in the stand of trees for a bit, so I explored the forest floor. I wandered in and out of tree trunks for awhile, finding game trails, other traces of animals, and a little evidence of humans that had blown in with the wind (which was promptly collected and placed in my garbage bag- remember Rule #27). I felt at home among the trees, but it was almost time to go. The wind grew colder, and the gusts blew harder. I’m no expert, but I felt like a storm was blowing in, so I decided to return to camp and start tearing down. It wouldn’t be too difficult, I packed pretty light. Everything got loaded up, garbage double-bagged, shelter taken down and packed. I bungee’d my sleeping pad to my Volta, policed the site, and used most of my remaining water to douse what was left of my fire. I mixed in some wet sandy soil for good effect, and rested my hands on it to make sure it was dead out. Camp Intrepid was officially packed up. Everything in the Volta, just before I strapped on the sleeping pad. Then it was time to go. 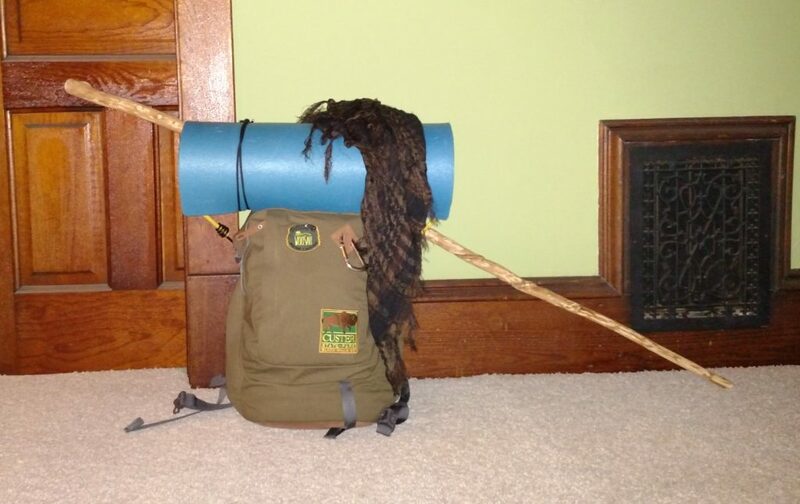 I slung the pack onto my back, grabbed my stave, and hit the trail. I hiked back so much more quickly than the hours-long extended hike I took to get there! 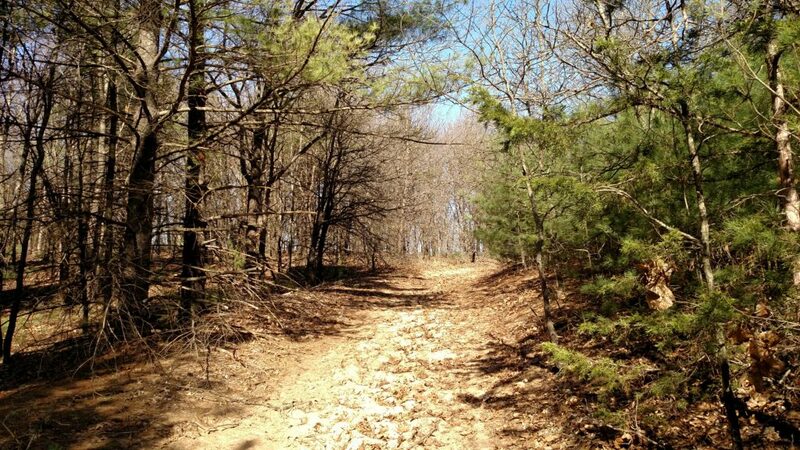 In about twenty minutes I had covered the sandy trails, up and down hills, and had made it back to the WeMib. Shortly thereafter I was loaded up and pulling out of the park. Ten minutes later the car was getting pelted by rain. I had a weird stay at Sand Ridge State Park, no doubt about that. I got lost, faced unusual weather, and found myself startled by a turkey taking flight (it’s funny, go ahead and laugh). But no trip is perfect, and nothing ever goes exactly as planned. That’s part of what makes it an adventure. This mix of landscapes is an oddity for the state of Illinois, but a beautiful one. This won’t be my last stay at Sand Ridge; there are lots of trails to explore, and plenty of sites in which to slumber. I enjoyed my weird stay, and I’m already looking forward to my next outing, whenever and wherever that might be! Have you ever had an outing with weird weather or when you got lost? Have you managed to have a great time even when things didn’t go according to plan? I’d love to hear about it, so don’t be a stranger and share it in the comments! Looks like it worked out well for a light hike and camp. Good one. I can’t really complain. All the problems were minor inconveniences, and the overall experience was fantastic! My recent production walk for StillWalks was a mixed bag of weather too – 50% heavy hail, 50% beautiful sunshine. Freezing cold in the hail, warm in the sunshine. Fortunately I had taken all I needed for the conditions. It was only a four mile hike but as a production walk took 6.5 hours with a 6.30 am start. Photography and field recording went very well I’m pleased to say. There was only one point where the route became confusing and I had been assured that the way was clear. I enjoyed your trek too 🙂 but just so you know, unfortunately a number of your photos are not showing 🙁 It might be a problem at my end but I don’t think so. Argh! Thanks for letting me know about the technical difficulties! I’ll have to see if I can work that out. I’ve never had the experience of trekking out with any kind of recording equipment, or photography gear beyond just my phone; glad to hear all your recording and photos went well though! Oh, it’s definitely helpful! They’re showing up for me, but I’ve got a couple other people checking, and then I can start to troubleshoot! I really appreciate you letting me know! Thanks! I’m glad you enjoyed it. I’ve faced my share of obstacles, and though I’m pretty decent at arresting panic before it takes hold, that wasn’t always the case! I used to be pretty jumpy and panicky, but good friends and teachers have worked that out of me! Can’t let a few obstacles get in the way of a great time. This seems to be happening off and on with this post. Every time I think I’ve got it sorted, off it goes and they stop loading again! Thanks for bringing it to my attention! No prob. WordPress gave me hell with uploading pictures yesterday too so maybe this is a widespread issue. Looks like mine are all visible though. Haven’t been told otherwise just yet.